see that you're not practising. Good girl. Tina Marina! Lovely dindins!" Bella Mireall mad a face. " She's not even looking at me," she thought.
" I'm looking at you and don't make that face," said her mother. 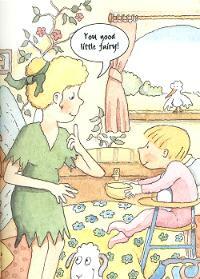 It was fun of the big problems with having a mother who was a fairy- you couldn't be sure when she was using her magic. And it was magic that was the problem now. "You will be starting fairy school next week and you can't even do a simple doubling spell," said Bella Mirella's mother. "Now, try this apple." Bella Mirella shut her eyes. She concentrated really hard. She tried to think of two shiny apples but it was hard when she felt so cross. Screwing up her face, she said the magic words: "Doubling spell Work out well!" Ping! "not a great success," said her mother, looking at the two oranges. "Let's go out into the garden now. But no playing for you, Bella Mirella. More practice!. "Perhaps you are better at simple changing spella," said her mother. "Change this watering can into...er... a bucket. Concentrate!" Bella Mirella looked hard at the watering can. She tried to imagine it losing its spout and handle. But just as she got ready to do the magic, Tina Mirella shut her eyes and her ear, and said, "Changing spell, Work out well!" Ping! "Bella Mirella, what are you doing?" her mother cried. "Poor little babykins!" 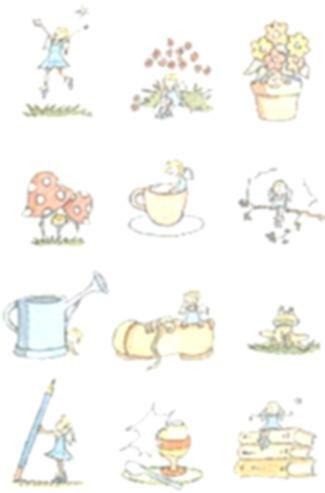 The little fairy had turned the watering can, but not into a bucket. Instead, she had turned it upside down! "Ooho, did the nasty water fall on diddums' little head?" 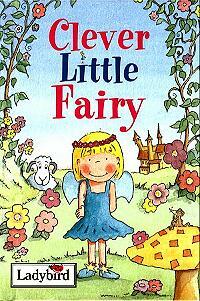 Bella Mirella's mother frowned at her oldest little fairy. "You know, Bella Mirella, there are three kinds of spell that you must be able to do before you go to fairy school: doubling spells, changing spell and moving spells," she said.
" It seems that you can do them all-but not at the right time! Now just keep an eye on Tina Marina for me for two minutes while I get her a dry fairy suit. And practise!" Bella Mirella sighed. She tried so hard with her spells but they just did not work out well. She looked at her sister. Some not-very-nice thoughts came into her head. Tina Marina was a frog! Bella Mirella was so shocked that she had to sit down. What had she done? And how?
" Oh on, this will mean double trouble," thought Bella Mirella. 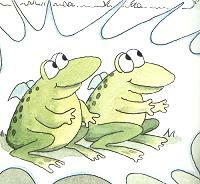 The two frogs were safely hidden away.
" Where's Tina Mirina?" asked her mother, looking around. Bella Mirella was about to panic when she suddenly realised how easy it had all been. There was no need to try really hard, or shut her eyes, or say magic words. 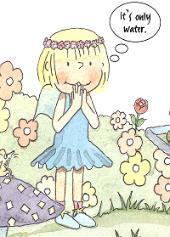 She just had to be herself and think like a fairy. Bella Mirella did a changing speel and a moving spell and advanced reverse doubling spell all at once!
" you are a very clever little fairy. I knew you could do it. You'll be able to teach Tina Mirina soon."